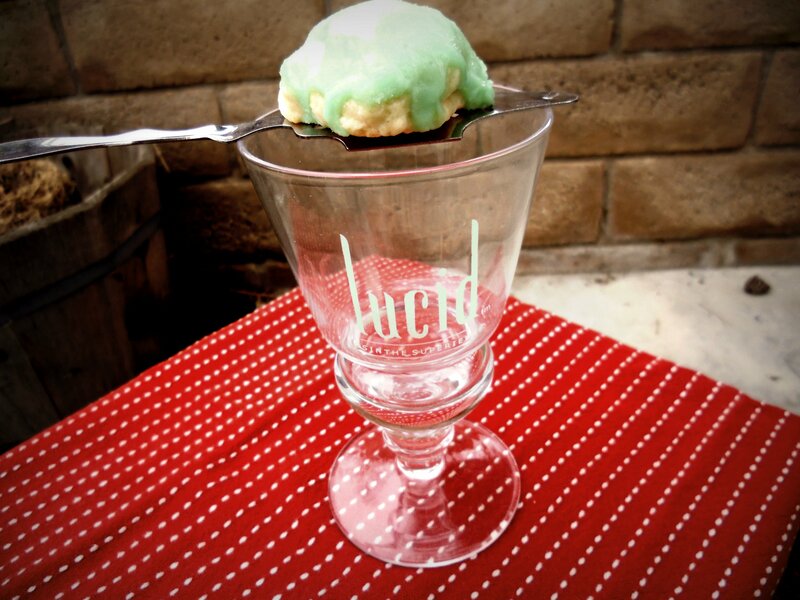 This weekend, I whipped up a batch of spectacular Absinthe Cookies using Lucid Absinthe for my cocktail buddy over at Boy Drinks World. Absinthe is a high-proof herbal spirit featuring fennel, green anise, and grande wormwood, as well as flavors of nutmeg, hyssop, coriander, juniper, and star anise. Typically louched with water to reduce the proof and open up the flavor, the drink features a distinctive cloudy, pale green color and heady aroma of licorice. Extremely popular among bohemians at the end of the 1800’s, absinthe was banned in the early 1900’s due to exaggerated beliefs of its hallucinogenic properties and other ill effects. After chemical analysis and vigorous campaigning, the spirit was reintroduced and has had a growing availability over the last two decades. This recipe gives you a very delicate, not too sweet anise cookie topped with a luscious, soft green glaze, redolent of the herbal character of absinthe. Because absinthe has a very high alcohol content and is not sweetened, this cookie packs an intense herbaceous punch, so is only for true lovers of anise and (of course) la fée verte.